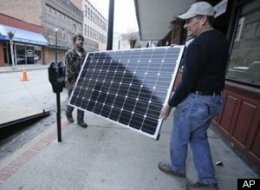 July 23, 2013 – MORGANTOWN, W.Va. — A group devoted to creating alternative energy jobs in Central Appalachia is building a first for West Virginia’s southern coalfields region this week – a set of rooftop solar panels, assembled by unemployed and underemployed coal miners and contractors. The 40- by 15-foot solar array going up on a doctor’s office in Williamson is significant not for its size but for its location: It signals to an area long reliant on mining that there can be life beyond coal. "This is the first sign for a lot of folks that this is real, and that it’s real technology, and they can have it in their communities," Getzen says. "In no way are we against coal or trying to replace coal. There’s still going to be coal mining here. This is just something else to help the economy." The Jobs Project teamed up about a year ago with a solar energy company from the Eastern Panhandle, Mountain View Solar & Wind of Berkeley Springs, to develop a privately funded job-training program. The 12 trainees are earning $45 an hour for three days of work, while some local laborers are earning $10 an hour helping out. Mountain View owner Mike McKechnie is also buying all his electrical supplies from a local business. "We are not funded by any state organization. We’re doing this as a business because we want to grow the solar infrastructure and industry," McKechnie says. "We’re West Virginians, and we think it’s important. There’s a need here that’s not being met." Demand for solar energy has been growing in West Virginia, and McKechnie’s company has been expanding with it. Mountain View has tripled in size two years in a row and is likely to do the same in 2011. It now employs 15 full-time workers, five part-timers and a network of about a dozen electricians, plumbers, roofers and general contractors who do installations when McKechnie calls. "This training model we’re unleashing in Williamson is something we’ve proven," McKechnie says. "It’s not a pilot project. It’s something we’ve shown works." Besides installing the rooftop array, the trainees and three of McKechnie’s employees will also be doing assessments on seven other properties this week. "What we’re doing is giving them a crash course. They get an introduction, and if they want to continue, then that’s who we’ll call in the future," he says. If they like the work, they’ll follow up with additional training in the Eastern Panhandle "to get them to a certain caliber, and then they’ll continue their training as we start to do work down there," McKechnie says. "We’re hoping they will go out on their own and find some sales leads and close those sales. We want to develop the entrepreneurial spirit so eventually they can go out on their own." McKechnie says he’s not worried about creating competitors because there’s plenty of work to go around. "The public wants it and they can’t find it," he says. McKechnie uses only American-made solar panels, and representatives of his supplier, Oregon-based Solar World USA, are expected to be in Williamson on Thursday for the public unveiling of the project. "We’re impressed with the focused enthusiasm and boldness of Mountain View Solar and Wind, and its partnership with The Jobs Project to spread the economic activity and financial savings of solar, and we want to do whatever we can to support and enhance the effort," Solar World USA spokesman Ben Santarris said. The rooftop array on the doctor’s office cost about $90,000 and McKechnie says it will produce 11.7 kilowatts of electricity, or enough to reduce utility costs by about 20 percent. The system should pay for itself in about seven years. Getzen acknowledges many people can’t afford such an investment. "It’s going to take a little while to get going," he says. But The Jobs Project is trying to figure out how to do projects without upfront capital. Already, he says, federal tax credits and grants from the U.S. Department of Agriculture can help reduce costs, and people can seek low-interest loans. "I just hope that through this project," Getzen says, "we find many more." Previous PostNew York City Labor Council Endorses Medicare for AllNext PostAug 24 March Gathering New Energy: Help Us With The Buses!